How do I know if I've been approved to join a Tribe? 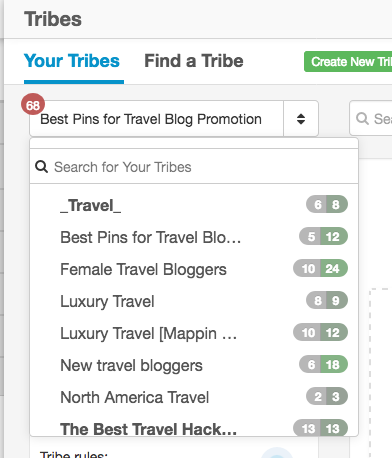 You can quickly check the status of your application to join a Tribe by going to the Find a Tribe page within your Tribes dashboard. Once there, click Open Tribe Requests. Here you'll see a list of all of your pending requests to join Tribes. This list shows you the requests that have not yet been approved or rejected by the Tribe admins. If you requested to join a Tribe, but it's not on this list, it means your application to join was either approved or rejected. If you were approved, then you should have access to it and see it on the Your Tribes page. If you don't have access to it and it's no longer in your Open Tribes Requests tab, then unfortunately you've been rejected for that Tribe. But don't give up! There are so many great Tribes to join, you can surely find another that will be a better fit for you! Read more about finding an Tribe in our Knowledge Base article: How can I find an active Tribe to join? If you're tired of waiting to be approved or rejected from a Tribe, you can learn how to cancel your request in our Knowledge Base article: Can I cancel a request to join a Tribe?